Venice or Verona, Italy, ca. 1430. Abbé Celotti; his sale, London, Sotheby's, Mar. 14, 1825, lot 48; Sir Thomas Phillipps (ms. 901); George Dunn; his sale, London, Sotheby's, Feb. 2, 1914, lot 799; Joseph Martini; purchased by Curt F. Bühler in Nov. 1961 from Bernard Quaritch, London (Cat. 820, no. 2). 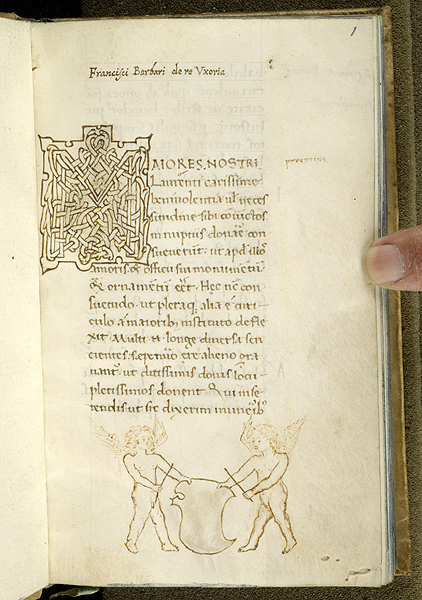 Ms. written and decorated in Venice or Verona, Italy, ca. 1430. The De re uxoria is said by Phyllis Gordan to have been written in 1414 or 1415 and dedicated to the elder Lorenzo de'Medici, who died in 1440--Cf. PML files. Scribe: Albinia de la Mare has identified the scribe as Alessio Germanico--Cf. Twenty-first report to the Fellows of the Pierpont Morgan Library. Decorations: 1 pen drawing, 1 interlace initial.